For years I am an enthusiast researcher and promoter of the act of repair, starting in 2009 with initiating the project Platform21 = Repairing and co-writing the Repair Manifesto. The response to this manifesto was overwhelming. It received worldwide recognition and was translated into many languages. 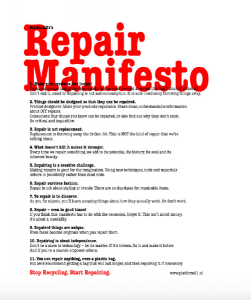 The main objective of the project and the manifesto was to reposition repair as a more sustainable alternative to recycling in a throwaway society. We also stimulated repair as a creative, innovative and activist activity and not just as a quick fix. The exhibition became a meeting place and repair studio for visitors with repair questions and visitors with repair skills. Together they would repair, hack, up-cycle or transform the broken product, while designers and artists would bring new repair techniques on to the table. Once you promote an idea that you believe in strongly, the best thing that can happen is that others take it a step further. This happened when Platform21 had to close down its doors and Martine Postma, a regular visitor of the Repair project, was inspired to continue the repair lab and she started the first Repair Café in Amsterdam. Now it is a volunteer organisation with 1450 repair café’s worldwide. Throughout the following years, working as an independent curator, I have given several lectures and workshops on repair or provided a platform for repairing. In the meantime I started to become interested in a broader perspective on the values of a repair cultures. Together with designer Cynthia Hathaway and design researcher Gabrielle Oropallo I wrote a proposal for the Istanbul Biennale in 2015 around the question ‘What would society look like of repair is central in thinking and doing?’ It was the beginning of Repair Society, a travelling fieldwork, research and dialogue platform that connects repair to all sorts of issues in society from all kinds of different professions and cultures. Imagine a society built on improvisation, imperfection, resilience, differences, and care. Would it be a society based on reflexive action rather than rushing forward? In Spring 2018 I will be elaborating further on Repair Society as a design thinking strategy with students from Designlab at the Rietveld Academy. Celebrating Repair, a joint project with Martine Postma, initiator of Repair Café’s to celebrate in 2019 the 10 years of existence of Repair Café and Repair Manifesto with a presentation of a speculative and actual Repair Street (as opposed to a shopping street). We are talking to the Dutch Design Foundation to organise this manifestation during Dutch Design Week 2019. June 2012: summer workshop at Boisbuchet in collaboration with Vitra Design Museum employees. September 2012: Repair as an act of resistance. Workshop at The University of Liechtenstein, faculty of architecture and economy, during the Compact projects week. May 2013: Repair Festival Day on invitation by the cultural institute De Vooruit in Ghent and in collaboration with Arne Hendriks. December 2013: Just another (im)perfect day, a curated program for the Studium Generale at Artez. In what way do we respond to imperfection as being part of the everyday routine? Does it make us stronger and inspire us? Or does it make us feel vulnerable and make us strive for perfection? And what do we define as something being imperfect? With lectures by Ben Highmore (Professor of cultural studies, University of Sussex) and Ellen Rutten (Professor of literature, University of Amsterdam) and workshops by Cynthia Hathaway (designer / curator) and Julia Mandle (artist / performer). February 2014: The Life of Objects workshop with students of Design Department Zurich University of Arts and in collaboration with Gabriele Oropallo and Cynthia Hathaway. 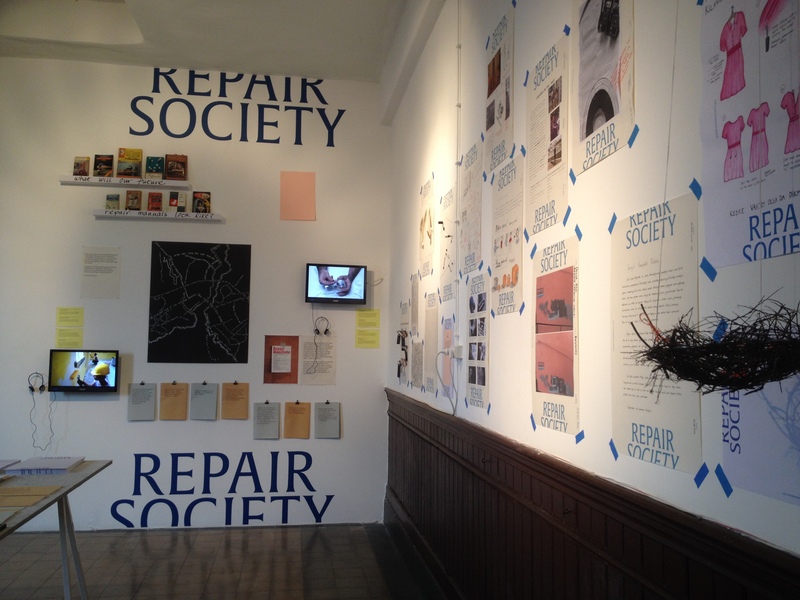 September – December 2014: Repair Society (workshop and exhibition) at Istanbul Design Biennial. Co-curated with Cynthia Hathaway and Gabriele Oropallo and in collaboration with design and architect students of diverse local Universities. We asked the students to research what repair means or meant in the lives of their grandparents or closely connected elderly people and to bring these stories into their own lives. The assignment sparked diverse emotional reactions, from amazement and love to frustration and anger. The personal reflections of the student were presented in the exhibition at the Biennial venue. Visitors were also invited to leave their own views behind in the expo, which soon turned the space into an activism room. October 2015: Magnus Ericson invited me to organise a Repair Society field lab in Ringvågen Stockholm. In collaboration with students following Organising Discourse at Konstfack University Stockholm. 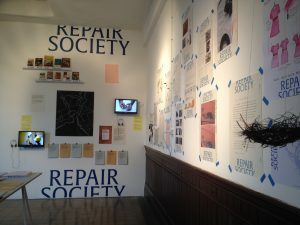 The students transformed a public space into a local research lab on repair and its meaning in society. Neighbours were invited to share their thoughts and skills. The main concerns addressed by the locals were the vast growing gentrification of the area and the loss of respect for craft skills and repair knowledge. The students organised several talks with amongst contemporary activist Gunilla Lundahl, sociologist and architect Mauricio Corbalan and curator Jan Ryden. November 2017: Symposium at Spring House In repair: towards a post throwaway society in collaboration with Prof. dr. Ellen Rutten researcher of the Sublime Imperfections NWO research program at UvA. With a keynote by Prof. Steven Jackson (coordinator of the NSF Repair, Maintenance, Sustainability research program at Cornell University), introducing ‘broken world thinking’. November 2017: Workshop at Spring House The umbrella recovery project. Reflections on society through an explorative workshop with artist Julia Mandle in which broken umbrellas are studied, repaired and hacked. With talks by Fabienne Rachmadiev (UvA) and dr. Yngvar Steinholt (Tromso University).